Researchers from Empa and the Adolphe Merkle Institute (AMI) in Fribourg have conducted studies on a 3D lung model to examine the behavior of graphene and graphene-like materials once they have been inhaled. Thanks to the 3-D lung model, the researchers have succeeded in simulating the actual conditions at the blood-air barrier and the impact of graphene on the lung tissue as realistically as possible – without any tests on animals or humans. It is a cell model representing the lung alveoli. 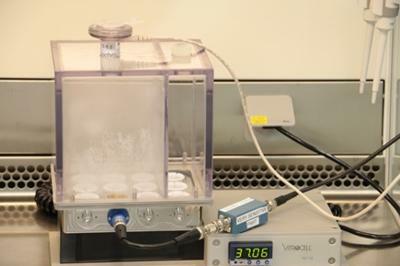 Conventional in vitro tests work with cell cultures from just one cell type – the newly established lung model, on the other hand, bears three different cell types, which simulate the conditions inside the lung, namely alveolar epithelial cells and two kinds of immune cells – macrophages and dendritic cells. Another factor that has virtually been ignored in in vitro tests thus far is the contact with airborne graphene particles. Usually, cells are cultivated in a nutrient solution in a petri dish and exposed to materials, such as graphene, in this form. In reality, however, i.e. at the lung barrier, it is an entirely different story. "The human organism typically comes into contact with graphene particles via respiration," explains Tina Bürki from Empa's Particles-Biology Interactions lab. This means that the particles are inhaled and touch the lung tissue directly. The new lung model is designed in such a way that the cells sit on a porous filter membrane at the air-liquid interface and the researchers spray graphene particles on the lung cells with the aid of a nebulizer in order to simulate the process in the body as closely as possible. The three-dimensional cell culture thus effectively "breathes in" graphene dust. In order to also trace chronic changes in the body, the SNSF project is set to run for three years; long-term studies using the lung model are next on the agenda. Besides pure graphene particles, the team members also expose the lung cells to rubbed graphene particles made of composite materials, which are classically used to reinforce polymers. Jing Wang from Empa's Advanced Analytical Technologies lab is also involved in the research. In order to estimate the number of graphene particles humans are exposed to as realistically as possible, Wang is studying and quantifying the abrasion of composite materials. Based on this data, the team exposes the 3D lung model to realistic conditions and is able to make predictions regarding the long-term toxicity of graphene and graphene-like materials.